As a wannabe foodie, I'm a little obsessed with The Food Network. One of the shows I frequently catch myself watching is The Best Thing I Ever Ate. This weekend, I had one of those 'ah hah' moments as I ate the best thing I've ever eaten. To celebrate graduation and Mother's Day, my family and I went to the Loring Pasta Bar. After carefully perusing the menu, I decided on the seafood spaghetti. And let me tell you, it was AMAZING. 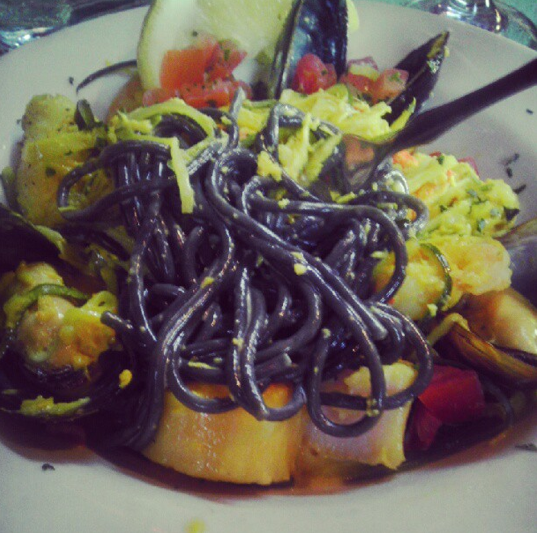 Made with squid ink spaghetti, the dish is packed with scallops, shrimp and assorted shellfish in a saffron cream sauce. Absolutely delicious. I could not have been more satisfied or impressed. Check out the Loring Pasta Bar ASAP. Here's a look at their menu!